Update, July 1st: the video of this session has been released by Linden Lab on YouTube, and is embedded at the end of this article. Meet the Lindens is a series of conversations / Q&A session with staff from Linden Lab, held as a part of the SL Birthday celebrations in-world. These present opportunities for Second Life users to get to know something about the staff at the Lab: who they are, what they do, what drew them to Second Life and the company, what they do, what they find interesting / inspirational about the platform, and so on. Friday, June 24th saw Dee and Patch Linden sit down with Zander Greene and Saffia Widdershins, and this article hopefully presents some “selected highlights” of the chat, complete with audio extracts from my recording of the event. Dee Linden is the Land Operation Supervisor for the Lab, and her introductions often includes the phrase, “older than the terrain itself”, reflecting her experience from the physical world realty market. She discovered Second Life in 2003, and quickly decided she wanted to be a part of the Lab’s and of Second Life’s growth, taking to dropping note cards on various Lindens, including Char and Philip, encouraging them to consider hiring her. This happened in around 2005, when she was recruited as a liaison, prior to joining the concierge team, where she was responsible for training Patch. When he moved to set-up the land team, she lobbied him to join the team, where she has a particular interest in supporting non-profits and groups seeking land for events. Patch Linden started as a Second Life resident, first joining the platform in 2004, and has been a male fashion designer, mentor, and community lead. His efforts with the latter brought him to the attention of the Lab, and it was suggested he consider applying to work for the company. Initially working as a support agent, he worked his way up through the concierge team, eventually becoming the team’s manager. He later moved to the role of Operations Support Manager for a year prior to pivoting away from support entirely and joining the Product group at the Lab, the group responsible for defining the features, etc., found within Second Life. Here he developed the land operations team, which includes the Land Department of Public Works (LDPW) and the Moles. He’s now the Senior Director of Product Operations, a role in which he is also responsible for the Lab’s support organisation. Can you tell us about the LDPW and the Moles? They’re actually residents, aren’t they? Patch: They are, they’re resident contractors … most of them have been working for us going on over five years, and the bulk of the core team is still together today. And we’ve added a good few, many more, to that number; I think we’re up to 22 now. And they run around and enjoy building experiences and fun things for residents to engage in in-world, like PaleoQuest. And We’ve got another new big and exciting project that’s on the horizon that’ll probably come out in the near future that I’m not going to talk too much about, but there’s something coming, and its going to be pretty big … It’s a big project, I think the count of regions is somewhere above 20, maybe below 30, and it will be an addition to the Mainland, and there is an actual gaming experience attach to it. How many sims is PaleoQuest? I know it is six, but there are several iterations aren’t there? Patch: Right, the region count itself for PaleoQuest is six, the core gaming regions. And there are, I think we’re up to three or four instances right now … But we load balance the traffic across the regions so that the game play remains smooth and stuff when it gets busy, in the evenings especially. Linden Realms is, surprisingly, still the biggest experience out there. It’s about double the size in region count and we have the same amount of instances on it, and it sees about three times the amount of traffic that PaleoQuest still does today. It’s kind-of built its own community around itself, hasn’t it? With people who go and play there regularly. And a lot of the work that we do, and the experiences that we build, that is one of our primary goals. We want to see people build up communities and enjoy what we do and socialise in them, have a good time; find something to spend some time doing. And really most importantly, to answer the big golden question for us, which is what is there to do in Second Life, especially with new users when they come in. We put these experiences out there so that they can go in and get a taste of the various things that they can do. Dee … you talked about being around since ’03 … Take us back to 2003 and some of your first impressions, and how some of those have maybe evolved and changed as the platform has over these 13 years. Dee: Wow! That’s a big question! 2003 we were paying for teleports, we were paying prim taxes for every prim you have rezzed, and the higher up off of the ground that it was, the more you would pay per week. We had the leader boards back then. Back then there was so much transparency between residents; every week you would see who has the most Linden dollars in-world right now, and I took a screen shot of the week I was number one with L$20,000! That was huge! We’re talking about when there were 17 regions on-line … There were who has the most calling cards, that was one of the leader boards, who has the most land, but like I said, the one with the most money, that was, “Oh my god! I made it! I made it! I’m the richest woman in Second Life!” So I took a picture of it. And it’s not just the technical underlying architecture of the platform that’s grown and changed so much; it’s the culture, these communities that have sprung up. You’re really been in a unique position with your work in the land operations to really watch as that’s happened, as these communities have sprung up and evolved. Dee: Yeah I have and you know, I love seeing that some of those earliest communities are still active and are still just as much involved now as they were back in 2003 / 2004. Patch, can I ask you, what aspects of the do you enjoy the most? Because you have quite a wide-ranging job. Patch: I love everything I do. I think that’s core to keeping someone engaged and very happy with what they do, is making sure they also love what they do is very important, and I can say wholeheartedly that I do. And the biggest thing I think that I hold near and dear to my heart, and I will say this, and I think I’ve said it in the past, is I walk in the residents’ shoes as part of my job every day. I make sure that everything we do is taking everyone’s viewpoint into account, because I was a resident myself and I think that gives me a very unique view and empowerment to be able to affect decisions and stuff that might change the course of Second Life as a platform. And I give it 100% of my best every day to make sure that we’re making the right decisions. So when I think about what I love the most to do, it’s knowing that I can have a positive influence and impact on Second Life as it continues to go forward. You were a very active resident back in the early days. Didn’t yo have one of the earliest male clothing stores? Patch: I did, and I was also one of the first original Second Life brands that’s in the wiki. I won’t give away any more than that; I do tend to draw a line between association of alts. But if you’re ever stumbling around in the wiki, there’s a small list of us who were the core founding original Second Life brands with trademarked names and stuff. And you can find that list and I’m one of those. Do you get much chance for that kind of creativity these days? Patch: Yes, but not necessarily in the same sense. A lot of my creative focus and energies go directly into the experiences and the stuff that we create. In fact, the experience we’re working on now, being as big as it is, has a huge amount of my creative influence going into it. A lot of the artwork, the concepts, even the theme and the name, I can say all came from my bucket of things that I like to pull out of creatively. Unfortunately, I don’t get to do a lot personally any more, for myself, for my store. In fact if you go to my store today, it’s like stepping back into a time machine, because it’s pretty much been sitting there since 2008. But I like it that way. When I do log into my resident alt, I get to go back there and reflect upon the great history that I’ve had as a resident and remember what it was like back then, and a lot of my designs were pretty timeless, so they’re not necessarily totally out of date. I’d like to hear from Dee of that, your favourite, most inspiring aspects of your work? Dee: I love creating islands. When it comes to building, I can barely put two cubes together, but you ask me to create an island and you tell me what you want it to look like, and it’s going to look like it. I really love terraforming, and I love surprising residents with a new island with custom terraforming on it. There’s something wonderful about the plasticity of the terrain, isn’t there? There’s just such a sense of real power to make it rise and fall to your desires. Dee: Or to make it look like my boss! You can make custom-made sculptures out of Linden terrain? Patch: Yes she can. I hate terraforming, so I tend to call it terrorforming, and I just leave that all to her. That’s her thing. I think we all want to know if there’s a Flickr group of some of your work, Dee? 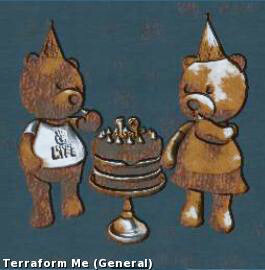 Dee: I have not put one together, but if you Google Terraform Me, you’ll see quite a few of them. And I invite it; because I like to see all sides of the story. So if somebody is upset, and we’ve changed something in Second Life; we change a policy or something feature-wise breaks, or something like that. and a resident is really passionate about why that particular feature maybe worked a certain way, and we changed it, and maybe we didn’t realise why we changed it, because it broke, or something like that. I really do not mind, and I like to see that feedback. Help me understand, as I want to listen to that feedback as to why it impacted that individual the way it did. And I usually like to dig into it. and sometimes that can be challenging; when you get into the fire with somebody, and they’re basically painting a picture of dismay and unhappiness around this particular thing. It takes a certain level of constitution and stuff to be able to go in and say, “OK, I understand and see what you’re saying,” and try to talk through it with them, and get all of the information you need, and come away with something useful so I can go, and again, try to affect and change the product positively, for the better, to correct, possibly, what’s happened. So I think that’s probably the most challenging aspect of my job, is I have to listen to everybody, and take all of that in, and then distil it and try to affect everything around me for the good. There are probably very few companies that have such a direct communication or dialogue between themselves and their consumers. Here that dialogue is quite literal and goes on 24-hours a day, practically. Patch: We are very, very lucky and fortunate to get in with residents to be able to talk to everybody directly. There are a lot of companies at have no open door type policies or they try to make sure you’re only subjected to one channel of feedback, through maybe a support department, or something like that. But we take a lot of information from all different directions, and I think we’re very fortunate for having that. And Dee, do you interact with residents every single day here, and is that something that makes your job more inspiring, more motivating is perhaps a better word? Dee: Oh, absolutely. I love working directly one-on-one or one on small groups with residents, helping them solve whatever problem they may be having or making a good situation even better. Is there a sense at the Lab that this is something that makes the platform stronger, and makes it better to have that direct dialogue with us as residents? Patch: I think so. and I think it allows us to be very flexible and also reactive, when necessary, to change. It was just said in the audience that it was a good thing when policy changed so the Lindens can talk to the residents again. I actually never had to stop. I was very fortunate, because I’ve always been in some line of support where I’ve always had some sort of interaction with residents throughout, and there was never a real policy to actually stop us from talking to residents. Patch: I don’t think we’ve had a primary push towards pre-teen, teens and young adults. The minimum age to use Second Life is 16, we’ve always been really open to inviting everything from corporations, businesses, educators, no-profits, on down the line of course to personal users, and I think that’s what makes up the bulk of Second Life up, all the time. So I think that’s the best answer I can give to that question, because I don’t understand the second half of the statement there, because that’s not generally been, I think, our primary focus. But to the first part of the question, there is an ongoing intention to bring organisations, be they educational, non-profit, corporate, what have you, into the platform? Patch: Yeah, and we do get contacts frequently from various schools, universities, non-profits, etc. One of the most recent ones and most interesting ones that I have actually been personally responsible for dealing with, is the Michael J. Fox Foundation. We’ve got a very good relationship with them, much like we do the American Cancer Society, and that’s a relationship we’re fostering as a business with them. Dee: Yes. OK, so there was this one day. I have just moved and had this really strange set-up for cable TV in my condo – just trust me, it was very strange. and I couldn’t figure out what needed to plug-in where, because different outlets had different channels coming through them. So another resident, a good friend at the time, built a set. He built my cable box, my TV, my VCR, my wall, the outlets, and then showed me with different colour cords, basically, exactly what to plug in where. and I thought, “Oh! What a great way to learn how to do this!” And that’s when I knew that there would be education in Second Life! Patch: A lot of our decision-making I actually take down to the entire team. You could almost call some of it democratic, some of it’s very fluid. Whenever we are going down the path of conceptualising or scoping a particular project, I involve everybody around me on an entire team to work on what it is we are going to roadmap going forward. I take everybody’s information and ideas. We tend to do these brain bashing sessions, that’s what I call them, because we will – you know, Saffia, the extent of PaleoQuest because we did a show on it. The design world we had in that session before PaleoQuest became a reality was 39 pages long. That came out of several multi-hour sessions where the entire team went through the entire design process of the experience from start to finish. And we took that document and it became a living, organic thing, that we followed from start to finish of building that entire experience out. The current project we’re working on, just as another example, is even bigger and it is even longer, and it is actually multiple documents, because we have different segments and sections to this particular project, between – well I can’t really tell you. You’ll see. But they are definite, distinct, we’ll call them zones, between the different sets of regions that are involved, and each one has its own storyboard, its own plan and project scope. And so we basically use the entire team to work through that process from myself, all the way down to the Moles, to QA, etc. Everybody that’s involved pitches in at that stage, and we work through it, and we do the project, and we get it done. Then as far as any decision-making regarding the larger organisation, it’s very much the same sort of thing. This is the case, I think in a lot of different places in the Lab. I surround myself with a great team. I’ve got Ebbe, I’ve got the rest of out core leadership and such. and we sit down and we discuss whatever project or initiative we have at hand, and we go through an iterative process on making decisions on where we want to take this. Patch: I’m definitely also not one of the folks on our …. we have a team of wizards; I really think they have some sort of magician’s power or something like that, who are really, really good, and they’re experts on the economy and such in Second Life. So, out of my real house, the Linden Dollar is a virtual token, so it in itself isn’t money … I don’t profess to be an expert on it, other than it’s a really cool that has enabled a lot of capability within Second Life from a merchant, land rental, product exchange standpoint, marketplace and stuff. Our entire virtual economy thrives on having that ability to make those micro payments and stuff like that, back and forth between everybody, and it’s a great thing that we have it. And obviously, there is a transfer mechanism between the Linden Dollar and real currencies. Do you have an idea of how those wizards do their magical formulas to work out how that exchange rate fluctuates over time, because it doesn’t fluctuate very much. They have a really good grasp on everything that’s going on; they know exactly what’s happening, when it’s happening. We watch it very, very closely day-in, day-out, those guys, they’re on top of it all the time. I do get pulled into some of those discussions because from my perspective, I’m watching land. And I’m watching the land economy and how that’s impacting everything, and of course that has a natural tie-in to the LindeX and the Linden dollar as a currency. That’s where it gets into my real house specifically, so I do get pulled into the conversations there sometimes. A question which draws together economics and land: can you explain about the new grandfathered land? What it is, what it does, and is what you’re doing with it proving successful? Dee: It is proving successful. It’s not new grandfathered, but it is the ability to buy your private island monthly maintenance fees down to the same rate as a grandfathered region. So if you go and buy a brand-new island today, your monthly maintenance fee is US $295 a month, but if you buy it down, then your monthly maintenance fee is US $195 a month, you’re saving US $100 a month. You know you’re going to keep that island for ten years? And trust me, we will still be here to support you on that island in ten years – then you’ve saved ten years of US $1,200 a year. Do the math. It costs US $600 to do it, versus saving US $1,200 a year. Patch: There’s also the secondary market as well. We refer to it as the secondary market, where you can go and acquire a pre-owned region from another resident, and you may also be able to save a little bit of money additionally that way, because the resale rate on a pre-owned region is generally less than what the set-up fee is, if you can find them. Dee: A lot of people have taken advantage of the buy-down opportunity. Are there any plans to do something with the costs of Mainland, especially with abandoned land. Have you got ways of dealing with that? Patch: So there’s two questions in there. There’s the question around costs, and there’s the question around abandoned. Abandoned land is something we are always addressing. We are constantly going out into the regions, reworking them, reselling land, especially when it is requested. In fact we prefer to work off of requests. If you are hunting around on the Mainland and you see a parcel of abandoned land sitting there unloved, if you really, really, want it, there is a special support case type that you file that comes directly to the team. You either will get potentially Dee or Guy, Bianca, Kiera, or somebody from the team who will actually go out there and work with you on getting that parcel that you would like. There’s certain requirements around that, which can be found in the Linden Knowledge Base, the rules around what we can sell freely and not that do come up from time-to-time, because cases come up where people do have a claim to a parcel than somebody else, and in fairness we of course want to do the right thing. And there are times when there is no claim or fair claim to a parcel, and we will actually auction it. And that’s where our land auctions come from; somebody will come to us and say, “I want this parcel here. It’s the entire region, so I have no true ownership claim here, so can you go ahead and auction it?” And we’ll put it up for auction. The rest of the land that does sit out there that’s abandoned, we do have general plans in the works for longer-term care and maintenance. We are also, as part of the other project that’s coming around the corner here in the future, will be addressing some of that more directly. And this is in the form of the various welcome areas and such, and I don’t want to again necessarily reveal too much ahead of time, but we’ll just say that there’s a lot in the works and you’re going to see a lot of new stuff out there. Patch: So here’s one of the cooler things about our jobs that we get to do. And that is, we also get to participate in the economy. Out of our land sales, for example, Governor Linden collects all of the funds [from] all of our parcel sales … And on an as-needed basis, like if I need a spectacular wardrobe or hair, or something like that, the Linden dollars are graciously given to me from the Governor, and I get to go shopping! So we give that back. We get to reciprocate that back into the economy and spend that back with the residents and the creators, to get my new outfit or something. We actually enjoy participating and doing that back with the residents and stuff like that. It’s something that’s very rewarding for us to do. We talked about this with Ebbe on Tuesday. There’s a loud, vocal minority, I would say, that cries this digital revolution we’ve been enjoying has made us more isolated … I would argue that it’s the opposite … what do you see when you look at that critique? Is there something fair about it, or are these guys missing the big picture? Dee: I think they’re missing the big picture. I have friends all over the world now, not just down the street. I’m much more outgoing a much greater percentage of the time, because of Second Life. Because of your avatar, your persona in Second Life. It’s made you more outgoing, would you say? Dee: Absolutely. It’s given me more confidence in real life, to. I think that’s something that most of us as residents can related to. And the whole purpose of these talks wasn’t just to see if we could get spoilers out of Patch about new plans, it was really to seek to get a better understanding of who you guys are as Lindens. And I think … Your candour is much appreciated; and that too, is something very unique. You wouldn’t expect the level of candour that Patch and Dee and Ebbe bring to these conversations; we’re not getting talking points, we’re not getting some kind of pre-chewed and digested and regurgitated statement. What we’re getting is human beings really equally looking at this thing and really being equally awed by it. I feel you guys are as enthusiastic about it as any of us residents are. Patch: That’s great to hear, and I’m really glad we can be a part of it, because it means a lot to me, and I know it means a lot to the team and everybody in general. That is probably one of the things that I think is unique again. And not only about our ability to be able to just do this, but also just being able to not do this in some scripted fashion or format. In fact I think I can legitimately say that I don’t think I have ever had a speaking engagement with Linden, as a Linden, that has ever been fully scripted. Patch: Long time ago, far, far away, the Mainland was kind-of viewed as the wild, wild west. We took a kind-of dystopian, non-interference stance with what the residents wanted to do with the Mainland in general, in the hope that – and in some places this was very successful – communities would form, bonds would happen, people would come together and you would have larger tracts or swathes of areas the Mainland start to gel together and become these unique areas. I personally can tell you, that’s where I started. The area of the Mainland that I started on was actually where I had originally bought one of my very first parcels on the Mainland. First Land, was the programme, I believe it was called at the time. And I got my first 512 square metre parcel, and I was hooked from that moment on. I bought more and more and more, and the next thing I knew, I had surrounded myself with 30 or 40 people I knew and enjoyed spending time with on a day in and day out basis, and that grew to being a six region area of the Mainland. So that was why it was kind-of left that way. From that point, Linden, and this would from before my time as a Linden, they went in and they put in other installations or structured areas. Like Shermanville and that sort of stuff, that had these neighbourhood themes, and those were super popular. They were structured, they kind-of resembled real life, where you had the streets and the sidewalks and the planter boxes and the trees and stuff, and a lot of people liked that to. So knowing that, we took that and created projects like Bay City. And Bay City’s been a hugely popular community mainland project, that I can tell you that our next project may have some learnings from it directly involved in it … We took a lot of our learnings from Bay City, and the community and the structure of the regions and such, the model that made Bay City so successful, and we’re rolling that into our new project. Land in Bay city is super expensive, but there are some beautiful communities run by residents. Like the East River, running down to the Sea of Fables. Patch: And you’ve got places like the Blake Sea, and all of the pop-up – not even just the attachment of the United Sailing Sims Regions that are bolted on to one side of the Blake Sea – but you’ve got all sorts of pocket communities that comprise a region or parcel or multiple regions that border that whole area. So again, it was more about, when you think about the Mainland as a whole, leaving it open and flexible for the residents to take and do something with it as they desired. And yes, that sometimes has been a consequence; you run across things like skyboxes and disjointedness, and things of that nature. But I’m still very pleased in general with how that product has endured the course of time. Dee, do you get to do that still/ Get out and explore, as we all did in those first heady days? Dee: Yes I do. I won’t say every day, but several days per week, I’ll set aside time, specifically schedule it for myself to go out and just explore and see what’s there. Patch: And I’ll do the same … I’ll pick a place and start going down a road, and I’ll just check out various areas. more times than not, I find myself fixing things along the way … but I love it, I have fun doing it. I’ll be adding the video as soon as I see it posted 🙂 .